Matt Godden celebrates his Posh equaliser at MK Dons. Photo: Joe Dent/theposh.com. Peterborough United manager Steve Evans reckons his side should have won tonight’s (September 4) Checkatrade Trophy tie at MK Dons 12-5! Evans was thrilled with his side’s second-half display as they fought back from 3-0 down at half-time to draw 3-3. They then lost a penalty shootout 6-5 as MK Dons took two points from the tie compared to one for Posh. Ivan Goney (17) goes close to scoring for Posh at MK Dons. Photo: Joe Dent/theposh.com. 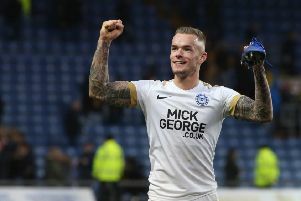 George Cooper, high-class substitute Jamie Walker and Matt Godden scored the Posh goals. They also missed numerous other scoring chances in a thrilling contest. Evans admitted he has some serious thinking to do before he selects a side to play at Southend in a League One fixture at Roots Hall on Saturday (September 8). “How we haven’t won that game is beyond me,” Evans said. “We were sloppy in the first-half, turned round 3-0 down, and yet missed the best four chances of the opening 45 minutes. “Those chances arrived from individual skill rather than cohesion and good passing football though so we changed things around a bit and after the break we were exceptional. Marcus Maddison of Peterborough United in action with Ryan Watson of MK Dons. Photo: Joe Dent/theposh.com. “We passed the ball at a proper tempo and carved them open at will. Marcus Maddison delivered some fantastic crosses, but their goal led a charmed life. “We really should have won about 12-5. They weren’t half chances either they were golden chances. On another day Ivan Toney, who played very well, would have scored a hat-trick. “The best thing about the second-half was that it’s got me thinking about Saturday. I have decisions to make. “Jamie Walker was outstanding. He lit up the stadium with that performance. We have signed a player there. “Defensively we were sloppy first-half, but we improved when Alex Woodyard came on and took control of midfield. “That second-half performance was exceptional though. That’s what I will take from the game. I asked the lads to win the second half in front of our fans, but we could even have won the match. We were that good after the break. “I wanted to win the game tonight. I was as passionate tonight as I am for a League match, but there was so much to encourage me for the future. “We showed what we are capable of. We are a club famous for never lying down and accepting defeat. We probably should have had two penalties.